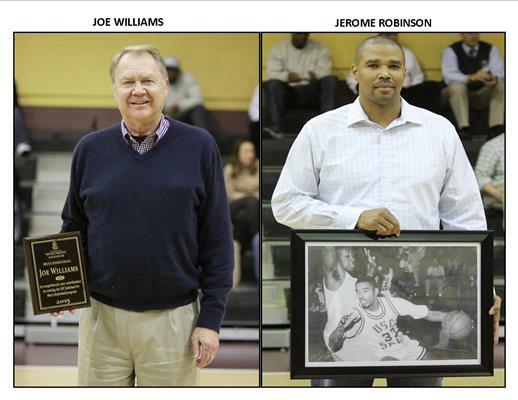 Joe Williams, the very first, volunteer coach at USC Salkehatchie. Joe had a great idea that basketball would be popular at the Salk campus here in Walterboro and so volunteered his time and efforts in 1990 to get it started. After that first year, a full-time coach, Coach Walrond, was hired and basketball at USC Salk was on its way. We thank you, Coach Williams, for having the vision to see this program could be where it is today. Tonight is a history making night for USC Salkehatchie basketball. In the seven year history of the USC Salkehatchie Athletic Hall of Fame and the 40 year history of intercollegiate sports at Salk, only 9 athletes have been elected to the Hall of Fame. Tonight we introduce you to the 10th member, Jerome Robinson, Men’s Basketball 1991-1993. Jerome Robinson came to USC Salkehatchie out of Broughton High School in Raleigh, NC. During his two years of playing at Salk, he was a unanimous first all-region team pick both years and was Most Valuable Player in 1992 and Most Outstanding Player in 1993. He led the Indians team in scoring, rebounding and field goal percentage in both seasons he played at Salk and still holds program records at Salk in most points in a career at 1,485, most rebounds in a career at 589 and highest scoring average in a career at 25.1. After receiving his Associate’s Degree from Salk, in 1993, he went on to the University of South Florida to play for two more years and then to play professional basketball in Europe for nine years before returning to Raleigh where he owns his own real estate business.